A classroom blog can be a powerful tool for improving communication with parents, for building a sense of community amongst your students, and for creating a record of what you and your students have learned throughout a school year. 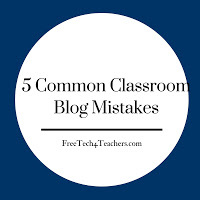 But you can only reap these benefits of classroom blogs if you maintain the blog and avoid some of the most common mistakes made in classroom blogging. If you make it optional for students and parents to visit the classroom blog, they’ll generally opt not to view it. It is better to post once a week on the same day than it is to post three posts in one week and two the next and four the following week. I often hear people say, “I don’t know what we should blog about.” Without a defined purpose for a blog it is hard to come with ideas for individual blog posts. If you identify a purpose, “weekly reflections on learning” is a good purpose, you will find it easier to come up with topics for individual blog posts. You might be thinking, “but my blog is public, isn’t that enough?” In the old days of blogging, it probably was enough to just make your blog public. People weren’t distracted by social media networks on their phones and in their web browsers. Today, you need to remind people that your blog exists. Schedule your blog posts to be automatically Tweeted, shared on Facebook, and sent in email. Apply the old adage of, “a picture tells a thousand words” to your blog posts. Putting an image or two into every blog post helps to draw readers into your posts. If you don’t have a picture that exactly matches your blog post’s topic, create one in service like Canva. I’ll be covering these topics and many more in my upcoming webinar series Blogs & Social Media for Teachers and School Leaders. This entry was posted in Uncategorized and tagged Ed Tech, Pedagogy on September 18, 2016 by pudentilla.